Jim Darlymple is saying “Yep” to the “nope” from Anand Shimpi on NFC (yes, it can get confusing!). NFC operates on the 13.56MHz ISM band, which has a relatively large wavelength, at 22.1 m. Making a traditional dipole antenna that radiates at all given the constraints of a smartphone package is thus a big challenge, considering that smartphones are maybe 5-inches tall at maximum, to say nothing of the supposed upcoming iPhone’s longest linear dimension. Darlymple often gets directives from Apple, which seem aimed at tempering expectations for upcoming products without an official announcement. The post is in response to an iPhone parts leak from yesterday in which a mystery chip was speculated to carry NFC. 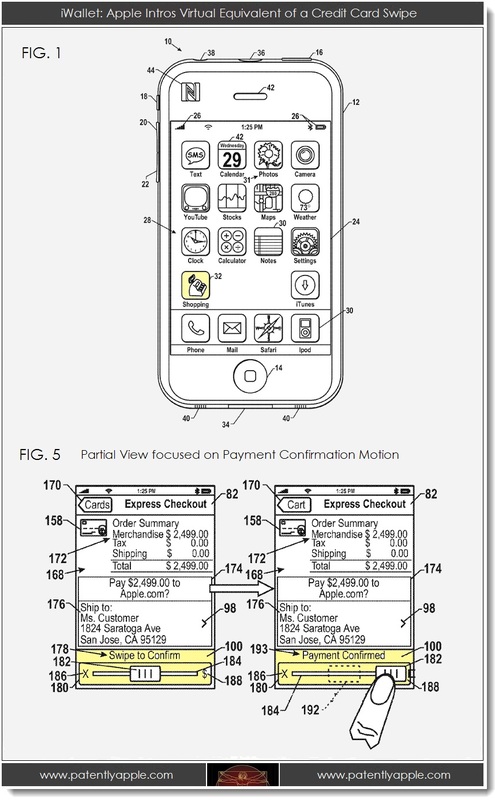 Coincidentally, Patently Apple dug up another new Apple iPhone NFC patent this morning that shows an NFC reader right at the top of the iPhone (44). Apple has clearly been investigating NFC hardware for a while. Meanwhile, Apple's iPhone-hardware division had already been studying technologies for over-the-air payments, including a version of Bluetooth connections that require less energy and near-field communication, known as NFC, according to several people familiar with the investigations. NFC technology lets users tap their phones at terminals near a cash register to pay. Google Wallet uses this technology, and Microsoft's service plans to as well. Apple employees patented some NFC ideas but worried about whether the technology was secure enough, and whether they could squeeze in the required chip and a new antenna without severely impacting the iPhone's battery life. Executives were also leery of the slow adoption of NFC among retailers, whom industry analysts predict won't adopt it in any meaningful way for three or four more years. When the payments plan came to an executive review in early 2012, several Apple senior executives balked, says a person briefed on the meeting. Apple's chief financial officer, Peter Oppenheimer, questioned whether there was newer secure technology that employed the Internet rather than use NFC, this person said. NFC hardware was found in code dumps from prototype iPhones by our sources as recently as late June. The New York Times also said over a year ago that NFC would be in an upcoming iPhone, and even John Gruber heard of NFC work at Apple as far back as six months before the iPhone 4.